The Biggest Sale EVER at Little White Dress! 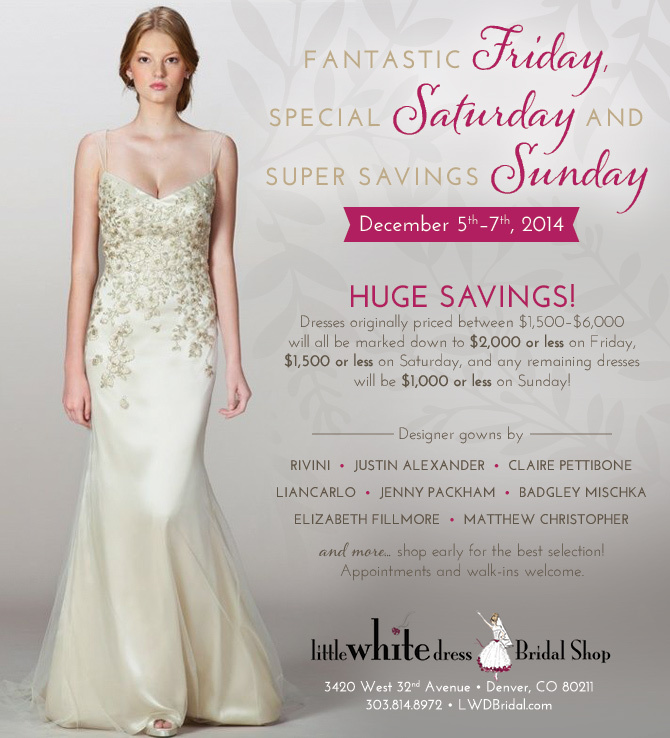 Join us for the biggest sale EVER at Little White Dress in Denver! Dozens of designer wedding gowns and accessories are available now through December 4th at 30-50% off, and anything not yet snatched up will be marked down even further December 5th-7th. Gowns by world-renowned designers Rivini, Claire Pettibone, Liancarlo, Jenny Packham, Matthew Christopher and much more are in excellent condition and available at a steal during this special sale event. Can't make it to Little White Dress? No problem! Shop the sale at our online boutique. We ship anywhere in the United States! Call 303-814-8972 today for more information or to schedule your appointment for the biggest and best bridal sale in Colorado!